There’s a new Bücherregal in Neugasse now. The old shelf was narrow and made of wood; it matched the street’s character. The new one is taller and wider, a piece of metal under slick grey paint, modern like the new Hallhuber store opposite. Even the wooden bench next to the shelf is new, a piece whose wavy back reaches the shelf’s eight-feet. The combination looks designed, not accidental. This end of Neugasse seems as though it wants to escape into the Hauptstrasse, all glitz and chic. I cross the shelf on my walks into the altstadt, and sometimes, if my return route leads me into Hauptstrasse, I take the perpendicular Neugasse back home too. There’s always someone standing at the shelf browsing books, but of late I’ve spotted, on three or four occasions, an old woman who mutters to herself while she goes about arranging the books. Not with a librarian’s tic for semantic organisation, but a stickler’s instinct for physical order. She picks up books left behind by careless passersby, large and small volumes lying horizontally or stacked in a pile, and sets them vertically in a row, the way they ought to stand in a bookshelf. Unused spaces are anathema to her: only when a row is packed does she allow a new one. She displays the manner of an impatient mother tidying up her son’s unruly desk, and not until she is done do I gather courage to scan the titles myself. The other day I found her standing on the bottom shelf, which is wider than the others, reaching for books on the top one. Dressed in jeans and a half-sleeved embroidered jacket over a shirt, she seemed like someone who cared about appearances. Her white hair, sightly ruffled, was held in place under two plastic hairbands and a pair of sunglasses. A black leather handbag, slung over the right shoulder, reached her waist. She was muttering as usual, and I waited, as always. 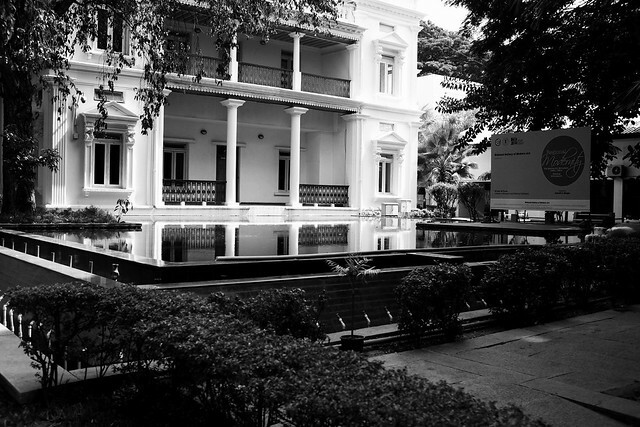 In April, a business trip to Bangalore led me to extend my stay in the city by a week. I spent it at home, with my parents and sister, eating mangoes and watching IPL on the television (often both at the same time). I met friends at their homes or outside. There was a Kannada play, a Kannada movie, a classical concert, a visit to the National Gallery of Modern Art, and even a live IPL game at the Chinnaswamy stadium. The city felt more familiar than before. I put this to my previous two visits (less than eight months apart) and to the writing, about the city, I had been engaged in the previous year. Bangalore was changing, but I now had a frame to place the changes in and understand them. Nonetheless, there were surprises. The gated community my parents lived in now had a system of verifying visitors via an app, MyGate. The app notified you about the visitor at the gate, and also triggered an automated call to your landline. You could approve the visitor either by clicking on the app or by pressing a key on the landline, but one did not exclude the other. The security folks at the gate still relied on the old system of directly calling the apartment: so instead of one simple call from the gate to the apartment, we now had two calls and one app notification. You could ignore the app, but the automated call was persistent. My father, eager for conversation, always responded verbally, trying to engage the automated voice asking the listener to “Press 1 to approve, 2 to reject.” He gave up soon, and these calls were picked up by someone else at home. The apartment’s monthly maintenance fee had recently been hiked to eight thousand rupees. Water, delivered to the apartment in water tankers, was the culprit. Bangalore’s water crisis and the water-tanker ‘mafia’ has been widely reported, and on each visit I read more descriptions of the alarming water situation in the city. But the most common response from the middle-class is to buy water from private operators. “We wanted flying cars, instead we got 140 characters”: this is Peter Thiel, a Silicon Valley entrepreneur, bemoaning the nature of present-day innovation. 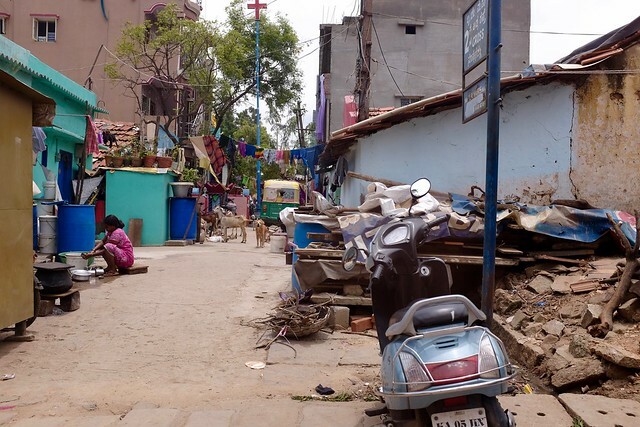 In Bangalore, one wishes for things more basic: water, clean air, good public transportation, garbage-free neighbourhoods. Bangaloreans complain about these matters, but (like people everywhere) they go on with their lives, few engaging in attempts to address them. What excites the young middle-class though is the next new app in town, or the cool new venture of a serial entrepreneur. 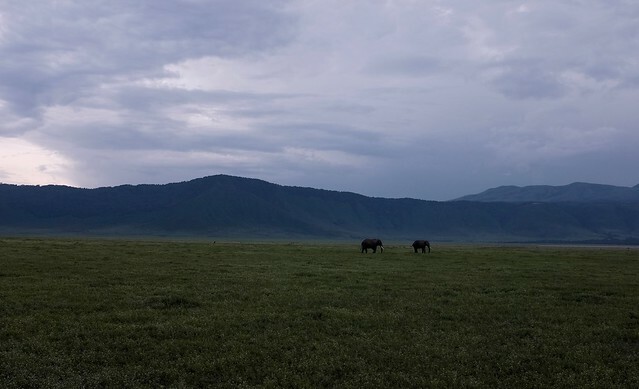 Inside the Ngorongoro crater, as we stopped to photograph the elephants, Gerald told us about the Elephant Graveyard. 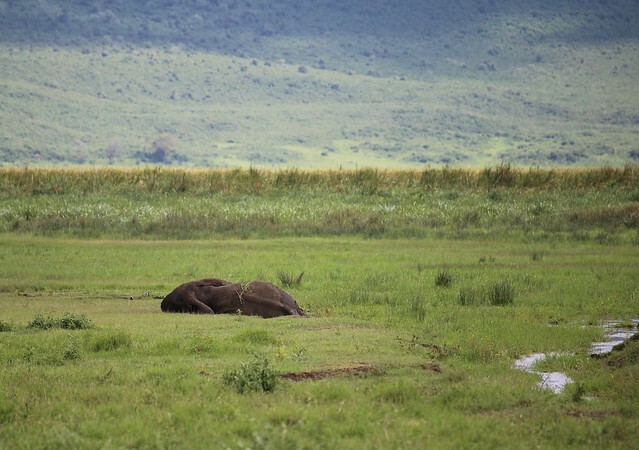 A marshy area with tall and soft grass, it attracted ageing elephants seeking easy access to food and water during their last days. Although Gerald did not directly say this, we left with the notion that ‘elephants came here to die’: poignant but misleading. On our drive to Serengeti and back, we passed small towns with a thriving roadside economy bound to this passing traffic. 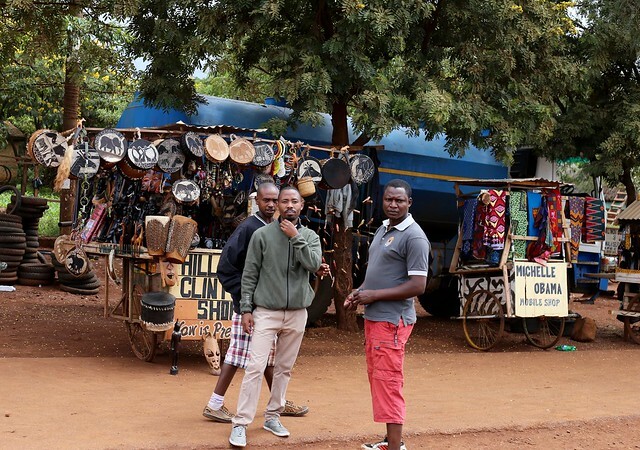 The bigger and more permanent shops were set a little away from the street: Mobile ‘Wakalas’ (agencies), bike repair shops, car washing centers, groceries, medical stores, and others whose purpose you could only guess at: Lelo shop, Joh Mix shop, Mama Soni shop, Dogo shop. Closer to the road we saw motorcycle taxis, autorickshaws (called “Bajaj” by the locals), and pushcart vendors selling all manner of things from bananas, corn, and cassavas, to handicrafts, shoes, and clothing. Hilary Clinton Shop and Michelle Obama Mobile Shop were labelled to attract the attention of tourists who fall for such tricks, and it worked on us to a point. We slowed down to take a photo. At a fuel station nearby, hawkers peddling handicrafts drifted towards our jeep. The boy — he was fourteen or fifteen — had a backpack strapped to his stomach and a smaller bag on his shoulders with wooden figurines peeping out. His left hand was obscured beneath a thicket of bracelets. “My name is Krishna.” He held out his hand towards my window. “Then I’m Rama,” I said, shaking his hand, and before I could withdraw it he had placed an elephant on my palm. The giraffe was no heavier than the elephant. “Try these!” he persisted, untangling a few bracelets. A man wearing dark glasses and carrying similar odds and ends arrived at my window. On instinct I began to close it. I left the window open and indulged in my curiosity, asking about this or that object. Krishna continued to maintain it was all ebony. When we were done fuelling, I thanked him and shook his hand. Our first day in Serengeti. We had just seen a leopard descend from a tree and walk away into the savannah — a rare sighting, in the opinion of Gerald, our driver-guide. Leopards were shy, and often the only glimpse they offered visitors was a faint flicker of a spotted coat behind a foliage. We were lucky. Gerald drove further from that kopje into the vast emptiness. 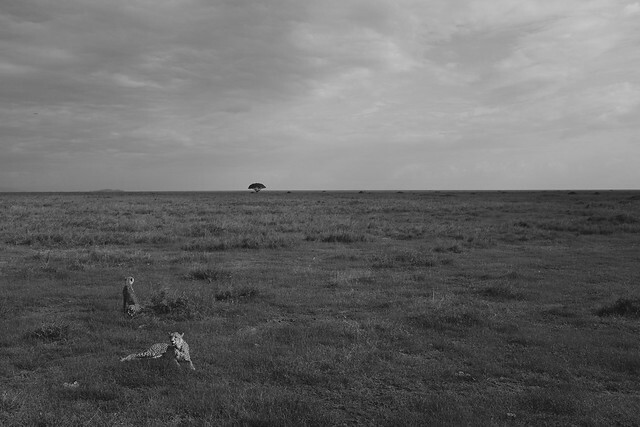 Some minutes later we saw, in a flash that lasted perhaps two or three seconds, a cheetah chase an impala. The impala got away. And in the instant the chase ended the cheetah lay down on the grass, a manoeuvre whose speed and grace was as stunning as the chase itself. Gerald said she was staying low to stay out of sight, to seek another chance, another prey. And he said it was our vehicle that had distracted the cheetah from the kill. We had saved a life; we felt happy. Then the cheetah’s young one appeared, following the mother. That young cheetah will probably go hungry today, Gerald said. He felt sorry for it. Our happiness was short-lived. Gerald stopped our 4×4 some meters from the pair. On the opposite side, a few hundred meters away, the impala stood looking in this direction, alert to any move by the cheetahs. But they stayed put, and we moved on. News of the incident arrived through the Internet. On Saturday afternoon someone had rammed his car into pedestrians in Bismarkplatz, a square two hundred meters from our apartment. Three people were injured. The attacker was pursued by the police and shot near the Alte Hallenbad on Bergheimerstr. We were home, but heard nothing. A friend sent an SMS asking if we were alright. My wife posted the news on Facebook. Earlier in the afternoon, as we walked on the Hauptstrasse, she’d observed how common it was these days to see a car on the pedestrian zone; these folks probably lived here, but vehicle access must be restricted, she said. After the incident, she recalled this conversation. People driving on the Hauptstrasse had begun to worry her of late, and now there was an event involving pedestrians on a square nearby. Around dinnertime the Hauptstrasse carried the usual Saturday evening buzz. There were no signs of change. Next morning, under a grey sky, I walked to the Grimminger bakery on Bismarkplatz. The car had run into the pedestrians right in front of this bakery. Two tulips and a candle lay beside a pillar nearby, circumscribed by yellow etchings on the floor that revealed where the attacker’s car had stopped. Not far from it a cameraman readied himself while a young blonde in a dark coat waited with a yellow mike. The bakery girls were chirpy. I paid for two rosinenbrötchen and a croissant before turning back. On the way home I ran into our neighbours M and A and their two boys. Smiles and greetings followed. I told them about the flowers and the cameraman on the square. M asked if I knew what had happened to the injured. No idea, I said. The smiles had vanished, eclipsed by murmurs of concern, but they flashed back as we said goodbye. That evening I learned that one of the three injured, a 73-year-old German man, had died. The accused was a 35-year-old German man, now recovering from the gunshot wounds. His motives were unclear. Terrorism was not suspected. We moved to Germany in late 2000, and our first visit to Bangalore came two and half years later, in 2003. I was curious to see how Bangalore had changed. I was also uncertain, after this period abroad, what to expect, and unsure of my response to the city. On that first visit I began to notice the differences between the privileged and the poor, an evident trait that had escaped my attention in the past. The inequality was striking, and I wondered what might be done to change this Janus-faced society. But by the end of the third week the gap bothered me a lot less than it had on the first day. The juxtaposition of luxury and poverty was a common feature here, and I had relearned to take it for granted. This conditioned indifference seemed natural and puzzling at the same time. It occupied my mind after I returned, but not for long: life in my immediate surroundings in Germany held a power those distant scenes lacked. The thoughts and emotions surfaced again on following visits to Bangalore. I saw that while some had grown visibly richer, things had barely changed for others; and what the streets conveyed was at variance with the growth statistics I’d seen. These observations were followed by a sense of helplessness, and later, indifference. On each visit the cycle was similar. Noticing the contrast, worrying about it, then ignoring it: after a decade this pattern was so well set that scenes in Bangalore (and my response to them) stopped bothering me as much as they once did. On every following visit I noticed less than I had before. It happened again in 2013, beginning with an incident the day I landed in Bangalore. Godhi Banna Sadharana Mykattu, a Kannada movie starring Anant Nag, begins with a boy playing with an elderly man. The game isn’t an innocent one. Using the old man’s failing memory to his advantage, the boy attempts to trick the grandpa-like figure. Soon he is stopped by a nurse, but we are the only ones to sense relief: the old man, an Alzheimer’s patient, isn’t aware of what has transpired. The backstory emerges gradually. Venkoba Rao has been admitted to the old-age home by his son Shiva. Incapable of facing the situation of his father’s condition, and unable to bear this responsibility after his mother’s death, Shiva distances himself from his father. One day Venkoba Rao slips away from the old-age home, gets muddled up with a couple of contract killers, and the rest of the movie follows the twin threads of a son’s search for his missing father (of ‘Wheatish complexion, average build’: the film’s title) and the tragi-comic predicaments of criminals who are stuck with a man carrying few memories but plenty of wisdom. The ending brings a resolution. Son and father are reunited, and along the way the son finds himself too: Shiva now regrets his earlier decisions. A neat and feel-good conclusion that reaffirms a comforting belief: this is a society that still cares for its elders and values how they are treated. The lines behind the REWE checkout counters were dense and busy. Christmas was behind us, but grocery shopping showed no signs of lulling. I placed my items — aubergines, thyme sprigs, olive oil, lemon, cheese, yoghurt, sambal oelek sauce, avocados — on the conveyer belt. The woman behind the counter was one of those sprightly, chatty ones who make you wonder if this isn’t the best job in the world. Middle-aged, in her early fifties perhaps, she wore her golden hair in a plait. A round face with wise wrinkled eyes. Simple stud earrings. No makeup. When my turn came, I greeted her and asked: “Haben Sie eine papiertüte?” Do you have a paper bag? “Ja, hab ich,” came the reply, as she scanned the groceries and put them aside. The typical response here is to hand a bag over to the shopper. The woman did no such thing; she continued to scan my items. At one point she looked at me with a cheeky grin, and said: You didn’t ask me for one, did you? You only asked if I have a paper bag. I laughed, and said: That’s a game I play with others! Well, now you see that others can play it too! She smiled and gave me the bag.